It was impossible to ignore the attention given to autonomous vehicles or so-called self-driving cars. Most of the automakers made mention of autonomous-vehicle technology in their press conferences. 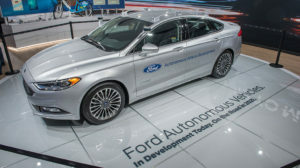 Ford has their next-generation Fusion Hybrid autonomous development vehicle in their display, Volvo debuted the XD90 Drive Me and Cadillac introduced Super Cruise in the 2016 Cadillac Sedan which allows the car to automatically stay in its lane, brake and accelerate. Daimler Chairman, Dr. Dieter Zetsche, said that Mercedes-Benz fully autonomous vehicles would arrive in showrooms between 2020 and 2030. Waymo (a spin-off of Google for developing autonomous car technology) showed a self-driving Chrysler Pacifica which has been in real-world testing. Naturally, the legal and liability issues related to self-driving cars still need to be completely sorted out, but it is undeniable that technology is progressing. 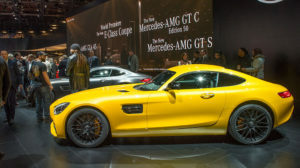 In addition to the all-new Mercedes-Benz E-Class Coupe, we were treated to a new AMG GT model to celebrate the 50th anniversary of the AMG brand, along with and a slew of other AMG models. The 2018 AMG GT S version bumps the biturbo 4.0-liter engine output to 515 horsepower and 670 Nm (494 lbs-ft) of torque. It’s a shame this one is not available with clutch pedal, but we’re proud that the solenoids and clutch mechatronics used to actuate gearshifts in the 7-speed AMG SpeedShift DCT are TREMEC designs. With the addition of the AMG GT, there are now six AMG models plus the AMG GT3 race car. The new E-Class Coupe is longer and sleeker than its predecessor. The long hood, raked windshield angle and swept back roofline give the car a look of style and speed. The E400 Coupe will be powered by a 3.0-liter V-6 making 329 horsepower, and backed by a 9-speed automatic transmission. Yes, it’s true, the German automakers led the news announcement at the Detroit Auto Show when it came to performance cars. 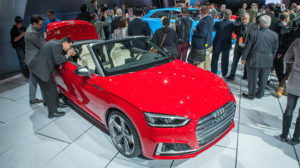 Audi showed the S5 performance coupe and convertible, the S4 sedan, as well as the SQ5 SUV. 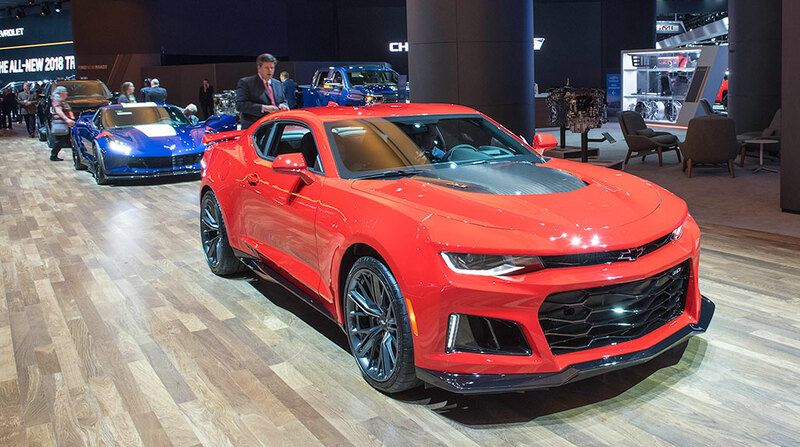 All of these S models are powered by a 3.0-liter turbocharged V-6 making 354 horsepower and 500 Nm (368 lb-ft) of torque. While it’s not a TREMEC transmission, we applaud Audi for offering the S5 and S4 with a six-speed manual transmission. 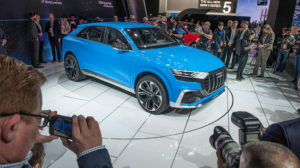 Audi also debuted the Q8 concept car which executives said would be the basis of a 2018 production model. The Q8 is a crossover vehicle that is wider and shorter than the current Q7. The Q8 will offer two-rows of seating. The concept vehicle is a plug-in hybrid with a supercharged engine and 17.9-kWh battery. Intriguing technology in the vehicle is the virtual-reality heads-up display that projects directional map arrows, seemingly on the road ahead to assist the driver with navigation. BMW revealed an all-new 5-Series at NAIAS, and had the North American debut of the X2 SUV concept vehicle, the all-new M760i xDrive and even a motorcycle. The long-anticipated 5-Series was introduced with three all-new models: the 530i, which offers a 248 horsepower 2.0-liter turbocharged four-cylinder engine; the 540i with a 335 horsepower 3.0-liter straight-six engine and the M550i xDrive performance sedan with a 456 horsepower 4.4-liter twin-turbo V-8. The flagship luxury performance sedan from Lexus is all-new for 2018. 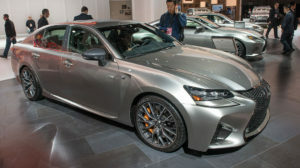 The new model is larger than its predecessor, and brings with it the current grille and frontend design of other Lexus car models. The LS 500 will have an all-new, twin-turbocharged, direct-injected 3.5-liter V-6 producing 415 horsepower and 442 lb-ft of torque. Admittedly, you may not instantly associate Kia with sports cars or grand touring, but the 2018 Kia Stinger is a combination of both. The design was led by Kia’s German-based design office, and the car has a wide, low stance typical of German sport-sedan grand touring cars. 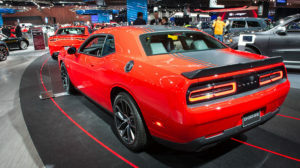 It will be available with two versions of a 2.0-liter turbocharged 4-cylinder making 255-horsepower and 360 lb-ft of torque, as well as a twin-turbo 3.0-liter V-6 making 365-horsepower and 376 lb-ft of torque and equipped with an 8-speed automatic transmission. 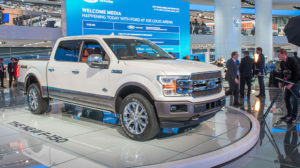 While basking in the glory of the F-Series being the top-selling truck in the United States for 40 consecutive years, Ford introduced the 2018 Ford F-150 with a restyled front end and interior, and announced that a 3.0-liter Power Stroke turbodiesel engine would join the list of available engines before the end of 2017. The company also announced that the Ranger pickup would return to the U.S. in 2019 and the Bronco SUV would make a comeback in 2020. Even Pixar and Disney stood in the spotlight at the Detroit Auto Show. 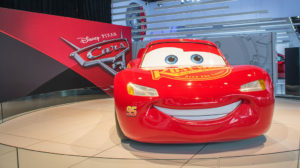 A lifesized – or slightly larger-than-life – version of Lightning McQueen rolled onto the stage as Pixar Animation Studios debuted the first clip from this summer’s Cars 3 movie. Which of these new vehicles on display at 2017 NAIAS gets you excited? Or what would you have liked to have seen? Leave a comment below!